Wolfstreet was asked to come up with a hero film that could lead Picnics new HR campaign. Despite the fact that Picnic is an online supermarket, the company will be offering employment to more than 10.000 people in the future. A large part of these employees are ‘Runners’, boys and girls between the ages of 18 and 25, who deliver the groceries. Because these ‘runners’ are the only employees that have face-to-face contact with customers, Picnic needs only the best people for this job. But how to reach these youngsters? How to inform but not bore them? Research shows that that content is more favourably received by young audiences when humor dominates the central message. With this in mind, we made a short mockumentary, in which we follow coach Nick. Coach Nick is the leader of the new Picnic Academy training program, and he continuously pushes his pupils to be the very best of the best. Because only the best people deserve the right to call themselves ‘Runner’ at Picnic. Company, Ten-hut! The unique recruitment approach soon attracted widespread media attention. Newspapers, blogs and websites (a.o. 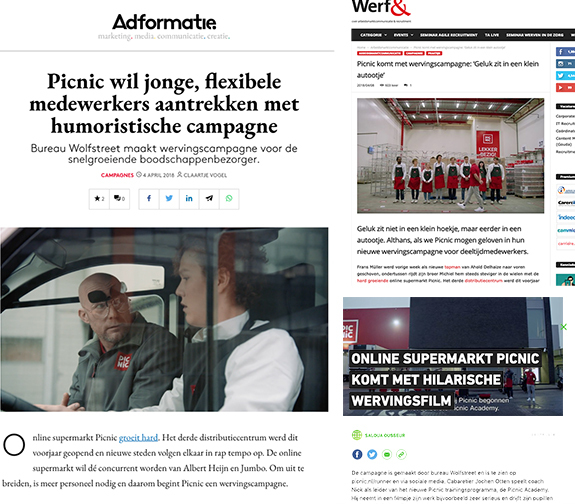 Metro, Adformatie, Werf&, Frankwatching, RecruitAcademy) featured and commented on the humorous lead film.